This location will require a full road closure for approximately two weeks. Vehicles will be detoured to 79th Street. After completion, the FRA and the PUC would need to review and approve the work to ensure that it meets their standards. It is difficult to estimate a timeline for work, but we would like to see our crossings become certified quiet zones by the end of 2019. 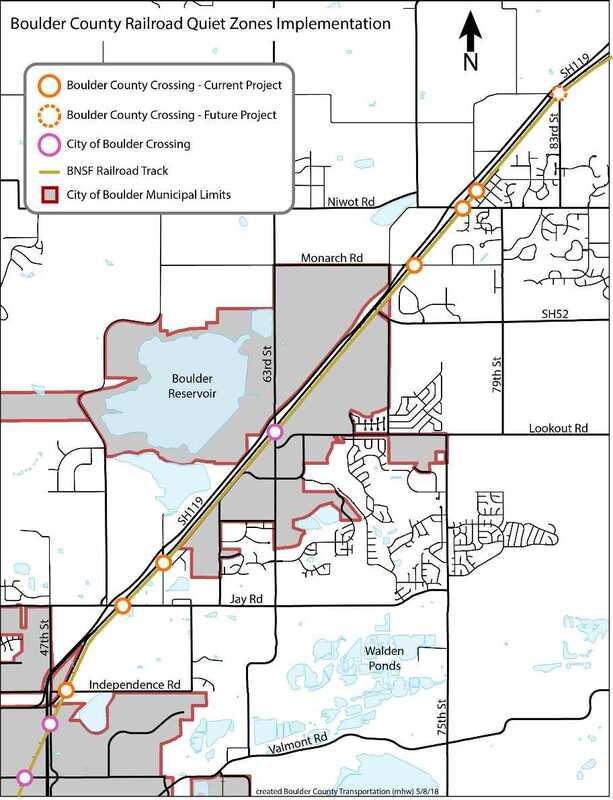 Boulder County has received a $1.4 million grant from the Denver Regional Council of Governments (DRCOG) to implement quiet zones along the SH 119/Longmont Diagonal corridor. The improvements and funding are an element of the FasTracks program for the Northwest rail corridor. Quiet zones are safety improvements to roads that cross railroad tracks, and, when implemented, eliminate the requirement for train horn use at those crossings. The county hopes to use the available funding to construct as many quiet zones along the Diagonal Highway as possible; however, the amount is likely not enough to address all of the unincorporated county crossings along the corridor. Since they first started rolling down the tracks, trains have sounded horns or whistles in advance of crossings as a universal safety precaution. Until recently, sounding horns was at the discretion of the train conductor, but in 2005 the Federal Railroad Administration (FRA) mandated that locomotive horns be sounded in advance of all public highway-rail crossings for a minimum of 15 seconds and a maximum of 20 seconds. The minimum volume level for horns is 96 decibels with a maximum of 110 decibels. This rule was established to address increased incidents at rail crossings. The FRA has also provided an option to reduce train horn noise by creating the opportunity to establish quiet zones. Generally, these improvements include some combination of improved crossing arms, curbing and medians to prevent vehicles from going around gates, improved communication circuitry between the tracks, the train and the crossing arms, and in some cases localized “wayside” horns at the crossings. The cost of a quiet zone can range significantly depending on the specific characteristics of the road and crossing, but commonly ranges from $250,00 to $500,000 per crossing. Read the conceptual cost evaluation. In order to be effective, all crossings within 1/4 mile of each other must be addressed in order to be designated as a quiet zone. Only local governments or public agencies may establish a quiet zone. Local governments must work in cooperation with the railroad that owns the track (Burlington Northern Santa Fe (BNSF)), the FRA, the Colorado Public Utilities Commission (PUC), and the Colorado Department of Transportation (CDOT) to assess the risk of collision at each potential quiet zone crossing. Even if a quiet zone is created and approved, train engineers have no legal duty to sound the horn, but may exercise discretion during emergency situations (i.e., the presence of a vehicle or person on the track). May 14, 2018 – County staff presented updated information regarding efforts to implement railroad quiet zones along the SH 119/Diagonal Highway corridor. Dec. 7, 2016 Public Meeting in Niwot – Boulder County presented information regarding efforts to convert railroad crossings along SH 119/Diagonal Highway into Quiet Zones. A question and answer session followed the presentation. Quantitative analysis of impacted properties at each crossing by decibel level.